The vast Palaeolithic period (c. 2.5 mill BP - 10,000 BC) refers to the period of time when humans began to manufacture and rely upon stone tools. Essentially, this era records the complex path towards the creation of the human animal, our sophisticated behaviour patterns and the birth of imagination. Our particular species, Homo sapiens sapiens, is thought to be only 100,000 years old, and it is therefore worth noting the Palaeolithic era included several other hominid species which became extinct. Our own species is now thought to have dropped to around 15,000 individuals c. 70,000 BP (1). revealing just how fragile our place on the evolutionary tree is. 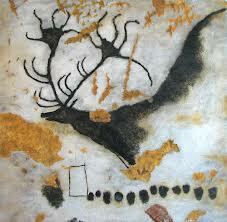 With over 350 examples of cave-art in Europe alone, there could be no better record of the Palaeolithic imagination. 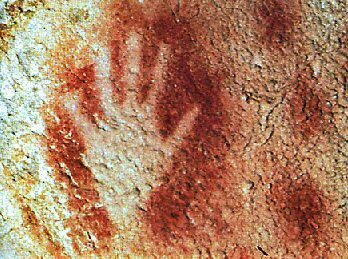 The earliest known cave-art is currently dated at c. 35,000 years ago, before which there is apparently very little to see. We are left with the idea that what we are looking at is the very origins of human consciousness itself. One of the most fantastic discoveries in recent years is the large number of 'Venus' figurines, which have been discovered from across the Eurasian continent. They exhibit both an accomplished artistic ability at the same time as ritualising reverence for the female form, but we still have little if any understanding of their original function or meaning. 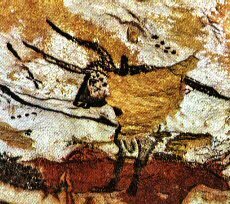 While it is difficult to be definitive about astronomy in the Palaeolithic period, there have nevertheless been several serious suggestions that notched bones might be lunar counts, and that certain images such as that seen at Lascaux might be representations of constellations in the night skies. It has been long considered that writing emerged 'independently in at least three different places between 3500 BC and 3100 BC' (2), Recent studies suggest that certain common Palaeolithic geometric symbols found around in cave-art around the world may represent a 'proto-script' from which all other scripts can trace ancestry. The Palaeolithic Era: A Record of Invention. Fire: Fire was used in a controlled fashion by the Lower Palaeolithic hominid as early as 1 million years ago (11) and possibly even earlier by the early Lower Palaeolithic (Oldowan) hominid Homo habilis. Early hominids may have begun to cook their food as early as the Lower Palaeolithic or at the latest in the early Middle Palaeolithic (c. 250,000 years ago) (2). Some scientists have hypothesized that Hominids began cooking food to defrost frozen meat, which would help ensure their survival in cold regions. 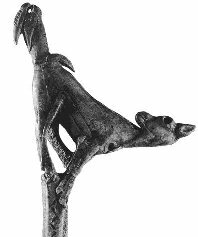 Weapons: Several specialised hunting weapons emerged during the Palaeolithic such as wooden spears (400,000 - 300,000 BP), The Bola (c. 30,000 BP) (7), the spear thrower or 'Atl-atl' (Image right, 'Ibex with bird' c.20,000 BP) (10), and the the bow and arrow (c. 25,000 or 30,000 BP). More than a thousand flint tools and waste generated on during their treatment were discovered near Pietrowice Wielkie (Silesia) by archaeologists from the Institute of Archaeology, University of Wrocław - told PAP head researcher Dr. Andrzej Wiśniewski. The flint workshops, remains of which were found by archaeologists, had been used by Neanderthals. The researchers are waiting for more detailed information on the site dating. The workshop is certainly more than 45 thousand years old. 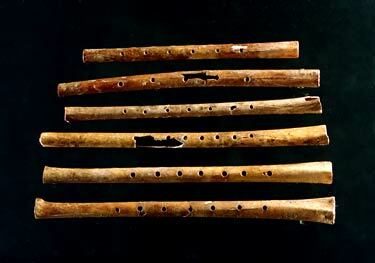 "Tools were made by a specific canon of Neanderthals living in Central Europe. These items have a cutting edge on both sides, they are bifacial" - said Dr. Wiśniewski. Woven Cloth: Woven cloth was being produced on looms over 27,000 years ago at the Dolni Vestonice site and others in the Czech Republic. 1). Dawkins, Richard 2004. The Ancestor's Tale, A Pilgrimage to the Dawn of Life. Boston: Houghton Mifflin Company. 3). Tedlock, Barbara. 2005. The Woman in the Shaman's Body: Reclaiming the Feminine in Religion and Medicine. New York: Bantam. 8). Christine Mellot. "stalking the ancient dog" (PDF). Science news.